Just a few weeks ago, April 5-9, I went on a trip with a local faith based advocacy group to visit immigrants being held at Corrections Corporation of America’s (CCA) Stewart Detention Center in Lumpkin, GA.
What I witnessed was truly inhumane. As an immigrant and activist I’ve heard the horror stories from friends and family about abuses in detention centers, but I set it upon myself to investigate the matter first-hand. I was lucky to be invited by a friend and local social justice leader Janet Bernhard from the Coronado Community United Methodist Church in New Smyrna Beach to attend a trip to Lumpkin, GA to visit detainees at Stewart Detention Center, a for-profit prison. Stewart Detention Center, operated by Corrections Corporation of America (CCA), is a notoriously awful center that has been described by some as a “living nightmare.” Azadeh Shahshahani of Huffington Post wrote that immigrant detainees at Stewart have insufficient or no access to translators, poor or no medical care, food infested with maggots and unsafe high temperatures. In 2009 Roberto Medina Martinez, a 39 year old Mexican immigrant and detainee at Stewart, died from an easily treatable condition while being transported by ICE to the closest hospital in Columbus, GA, nearly 45 minutes away. And this is just one known examples because communication between detainees, their families, and advocates is extremely difficult. This is large part due to the restrictions put on those who want to visit detainees, including family and attorneys. All visitors must wear “socially acceptable” clothing which prohibits shorts, tank tops, sleeveless shirts, above mid-thigh skirts, “short dresses,” closed-toe shoes, leggings, pants/jeans with holes in them, half or no sleeve blouses, any see-through garments, hats and caps. Women’s underwire bras also frequently trigger the metal detectors, restricting from entering to visit detainees. If you have a medical condition or implant that sets off metal detectors, you must bring medical documentation. Also, you cannot bring anything into the visitation room, not your phone, a note pad and pen, reading material, nothing. Many visitors to Stewart Detention Center are not aware of these restrictions and are turned away. This only scratches the surface compared to the treatment of visitors by the staff of Stewart Detention Center. I was shocked by the way my fellow visitors and I were addressed by the guards. They were excessively rude and mean, yelling at us to STOP TALKING (forcing us to whisper), SIT DOWN (no standing up no matter how long you have been waiting), there are no bathrooms, no water fountains, and again, you cannot have any belongings with you (no books, magazines, papers, phones, nothing) and you cannot wait in your vehicle. I waited a total of three hours to visit with no access to a bathroom or water. If this was the acceptable way we were treated by the guards, I can only imagine how they interact with the detainees. After all, these detainees are not formally “prisoners” and Stewart Detention Center is not a “prison,” but a holding center for immigrants being processed by U.S Immigration and Custom Enforcement, I.C.E. 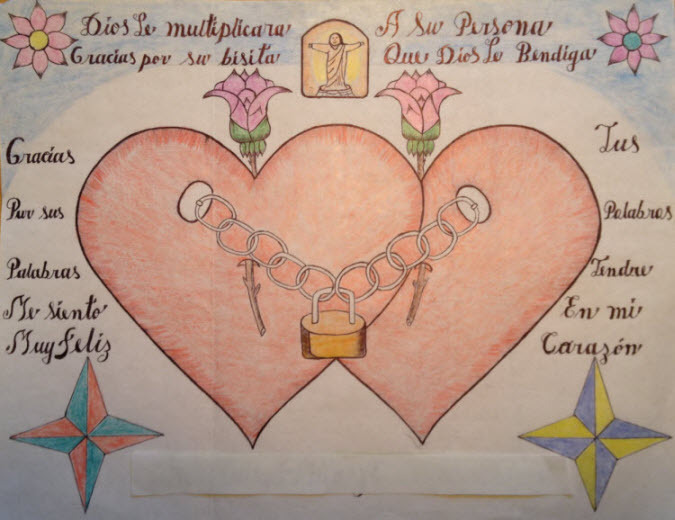 When I finally got to visit a detainee after a three hour wait, he arrived chained to a wheel chair and with his face masked like a scene from Silence of the Lambs. I soon found out that he was being held in segregation, also known as solitary confinement. Previously, we heard stories of detainees being punished with “segregation” for arguing for their right to a $2 a day job within Stewart, asking questions, complaining about food and conditions, conversing with staff when not prompted to and others. Roque Planas of Huffington Post wrote an excellent report about detainee abuses at Stewart Detention Center here. After arriving, the guards removed his mask and our conversation immediately started flowing, he was in “segregation” for 4 days with 16 days to go. The effect that solitary confinement had on the detainee was visible. He was so excited to be able to talk with someone and be able to hold a conversation in Spanish. I was surprised about how optimistic he was, speaking about going to college, seeing his family, cooking food he loved and missed and leaving his current detainment in the past. Our conversation was abruptly ended by a guard who pulled him back into his wheelchair, put him back in chains and pulled him away; without warning or consideration of our exchange. After our visit we departed the detention center and began trading stories. 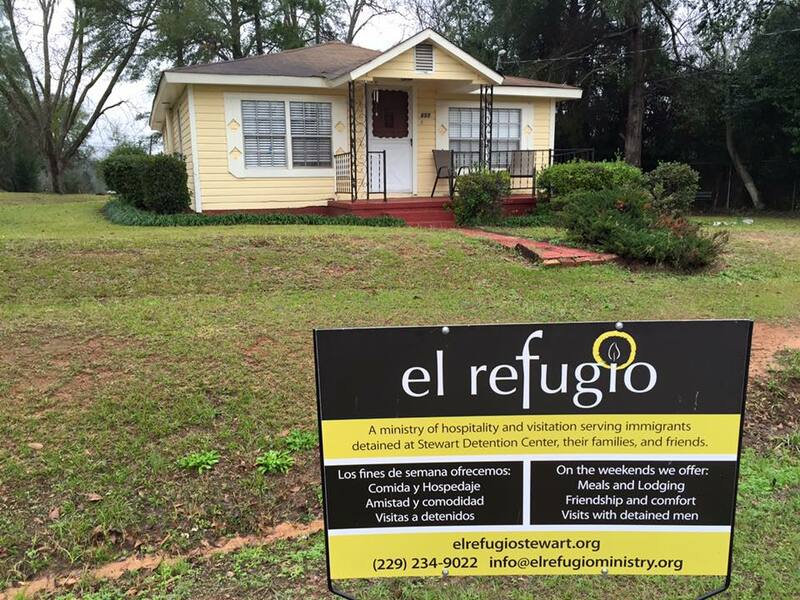 El Refugio, a hospitality house in Lumpkin, GA near the Stewart Detention Center who serves the family and friends of men detained there, briefed our delegation on what to expect and how to conduct ourselves while at Stewart, but there is no substitute for firsthand experience. Amilcar Valencia, Executive Director of El Refugio, told us to not use the names of detainees we visited in any sort of story or article because of the retaliation against them, but through El Refugio we could correspond with the detainees. El Refugio is a non-profit that provides free meals and lodging for families of detainees, friendship and comfort, and arranges visits with the detainees at Stewart. There are no hotels or other lodging in Lumpkin, GA and El Refugio provides a priceless service to the families and friends of detainees that they otherwise would not have. Their selfless work often goes unrecognized and I would like to personally thank El Refugio for the hospitality they showed and the knowledge they shared. Upon returning home, I did research delving deeper into the history of Stewart Detention Center and was even more shocked about what the detainees go through. My biggest revelation was that Stewart is only ONE of many for-profit immigration detention centers used by ICE, that and the numbers showing just how profitable and prolific the privately owned detention business is in the United States. Sharita Gruberg of the Center for American Progress reported that the “increase in detention bed space coincided with an increase in spending on immigration detention from $700 million in FY 2005 to more than $2 billion today (Dec., 2015). Not surprisingly, this spending increased revenues for CCA and the Geo Group (another for-profit prison company).” Gruberg went on to note that ICE contracts alone account for 13 percent ($28 million) of CCA’s $221 million revenue in FY 2014. At the same time their revenues doubled between 2005 and 2015, CCA spent $18 million on lobbying Congress with more than $8.7 million spent solely on Homeland Security appropriations. To me, it’s blatantly obvious who has had the largest impact on our national immigration policy and who is responsible for the misery that many immigrants endure while in detention here in United States, those who profit from it. I can’t help but think of all the families that these companies and policies have hurt over the years; people disappearing on their way to work, families having their doors kicked-in in the middle of the night, U.S. citizens and permanent residents being illegally detained for months because of their names. After seeing the conditions that human beings were subjected to at Stuart Detention Center, I’m truly sickened knowing that this could happen to so many people I hold dear. Let’s make sure we elect a President and Congress this fall that will rid us of this horrible business of detention and misery. A President and Congress that seeks to help our undocumented sisters and brothers become citizens, be treated as people and live in peace, not fear. This article originally appeared in Peoples World and was reposted with permission from the author. For a more indepth version of this post please visit their website here. © 2009-2019 Fight For Florida, Inc. All rights reserved.